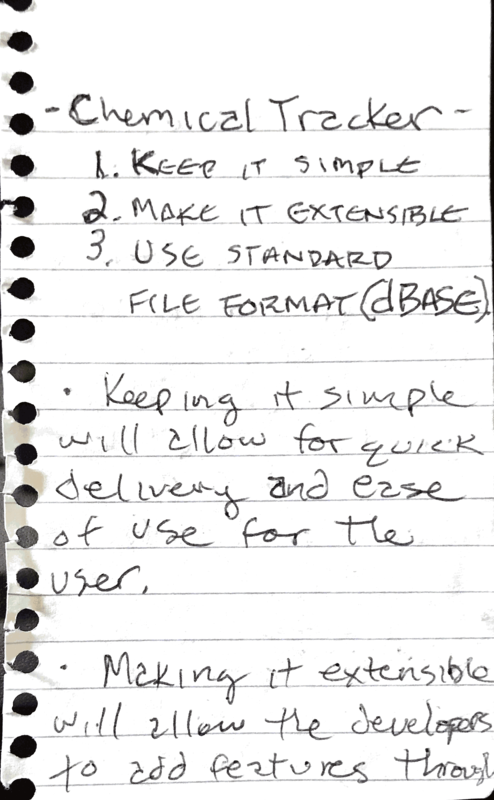 I was cleaning up around my desk this afternoon, it’s a complete wreck most of the time and it’s been super bad for a while now, and I happened upon some notes I created somewhere in the mid to late 90’s. Early in my career, around 1988, I worked for a company called AgData and one of their offerings was a chemical tracking application called ChemTrak. 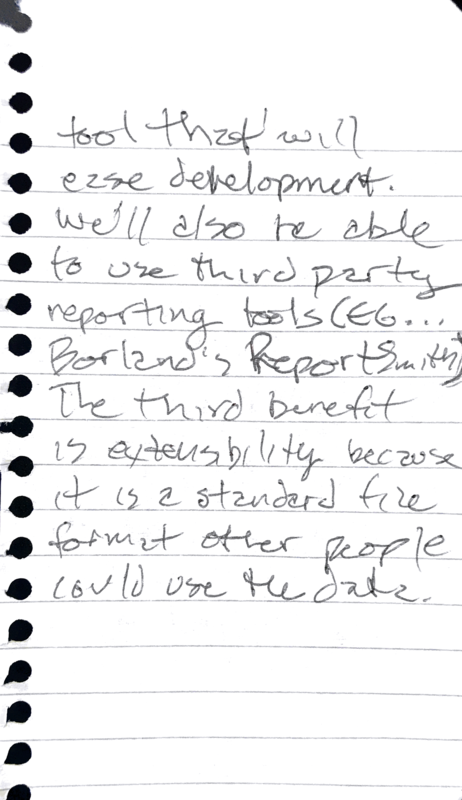 It was a chemical use reporting tool for the State of California and I had a bit of a fascination with it. I always wanted to write a version for Windows. That’s where the notes come in. I was writing down what I wanted it to do. 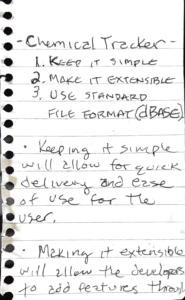 It was a pretty simple list but it would’ve been a great little Windows app. Now, Agrian, my employer, does all of that and a whole lot more. Anyway, here are the notes. The idea was to make it simple and extensible. 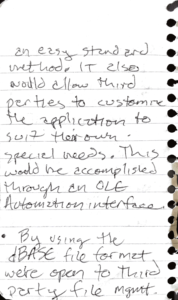 I was going to create a plug-in architecture so someone would write a .DLL the main application would know how to load. 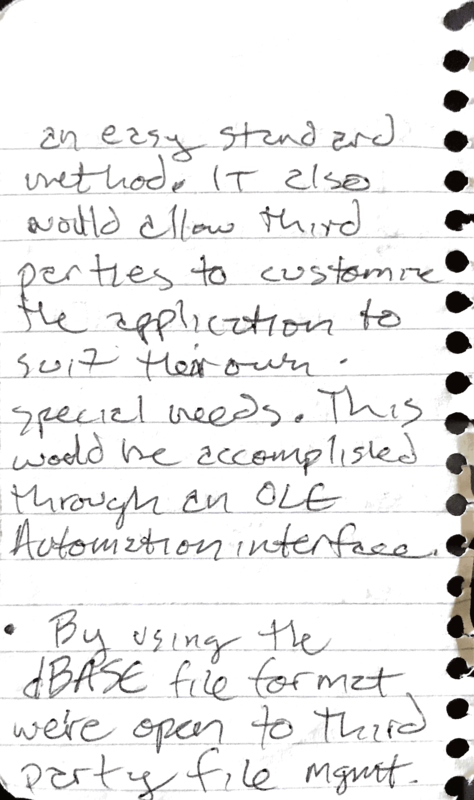 On the database side I was going to use a standard dBASE file format so folks could write their own reports using standard tools at the time. 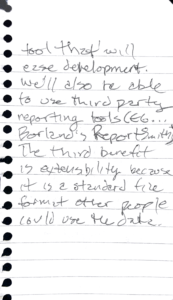 Apparently — at the time — I thought Borland’s ReportSmith was a good idea for that. After AgData I worked at Microsoft, then Visio for 10 years, then did video decoders for seven years. I made some other stops in between. Now I’m back working on Agricultural solutions. Feels good. The notion of being Swifty kind of bugs me. If you work in a language long enough you’ll naturally gravitate to language conventions or you won’t. If you’re an Indie, like Becky, I don’t think it really matters how Swifty your code really is. What matters is you’re willing to learn and adapt with the times and you can ship. If you don’t ship you don’t get paid. I’m probably not very Swifty either, but I don’t really care. I can write code in Swift and it works just fine. During code review with my peers they’ll let me know of a more Swifty way of doing things so I can either make a change or get it the next time. I’m willing to do the new thing and I think that’s what we need to be willing to do if we’re going to survive as developers. Be ready for change and adapt. That doesn’t mean you have to do it all on day one. Just be willing to make the change. I’d mentioned a few weeks ago that I was moving to Hugo. The motivation for me was simple. I’d not made my self-hosted WordPress blog secure enough so a not very nice person got into it and did mean things. I was not pleased. Some of you may be asking yourself, why not fix it and keep using WordPress. Good question. Basically I’ve done that twice now. This time around required deleting my installation and reinstalling. It worked out quite well and I decided not to install a number of plug-ins I’d been using before, including Jetpack. My weblog is actually quite a bit faster now as a result. That is super important to me. All of my current WordPress posts, like this one, have that structure. My plan is to import all of my WordPress posts into my new Hugo site, so it needs to be backward compatible. Anywho. Here’s how I plan to configure my weblog. Use GitHub for storage – Posts will be edited locally as Markdown and pushed to GitHub. Use GitHub for publishing – Once a post is pushed to GitHub it will cause a GitHub server trigger to run. That will pull the source on my host. Run Hugo on the host – Hugo will live on my host and will be run when the GitHub server trigger executes. Using those steps should allow me to easily update anywhere I can pull code from my GitHub account — even on iOS — and push changes. For now I plan on using BBEdit on my Mac for writing but in the future I hope to use my own Blogging Tool. If anyone notices a flaw in that logic please get in touch. My email address is rob.fahrni@gmail.com. Our youngest daughters nickname is Bug. Here’s a conversation with Bug from 2011. Enjoy. Can you tell we love movies?